Why move to the Shuswap? Come for a visit and you will want to stay a lifetime. 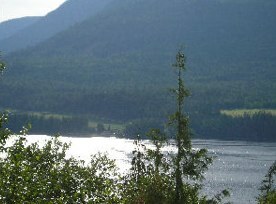 Among lush mountains and valleys, you will find towns and communities at the edge of beautiful Shuswap Lake. Breathtaking views of the lake, mountains and valleys as well as the mild climate make the Shuswap a favorite destination for relocation, recreation and relaxation. 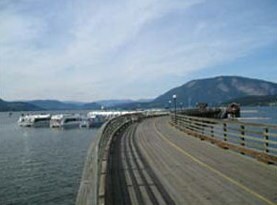 The largest of these communities is the City of Salmon Arm. The city has a population of over 15,000 and a trading area of 40,000. It is conveniently located midway between Vancouver and Calgary. Known for economic diversity, Salmon Arm maintains tourism, forestry, manufacturing, and commerce industries. The Shuswap is famous for its locally grown fruits and vegetables. Salmon Arm offers three shopping malls, an assortment of retail outlets and downtown shopping. The city maintains public transit, elementary through high schools, an OUC College campus and a variety of churches. The area boasts first class golf courses, service clubs, restaurants, campgrounds and a variety of outdoor sport options. Warmer weather activities include fishing, bird watching, mountain biking, hiking, wind surfing, canoeing, house boating and team sports. During the winter snowmobiling, skiing, ice fishing and snowshoeing are popular. In the fall save time for the annual Fall Fair and the famous Adams River Salmon Run. The Shuswap is a very sought after area known for its beauty, friendly communities and 1000 kilometer of pristine shoreline. Opportunities in the Shuswap continue to grow, there is something for everyone.